The uniform kits (shirt, shorts, and socks) have already been pre-arranged by Soccer Unlimited. All players U8-U10 will be purchasing the kit with the maroon shirt, black shorts and maroon socks. All Players U12 and up will be purchasing the kit with both a maroon shirt, grey alternate shirt, black shorts and maroon socks. There will also be an option for black socks to be purchased for the alternate uniform but that is not required unless your child’s coach instructs you to buy them. When you go to order your child’s kit, please be sure you have clicked on the proper age group and gender. When you order you will also be asked to provide a uniform number. Your order can’t be completed without it. That uniform number is assigned by your child’s coach and should have been communicated to you before you go online to order. Please contact your child’s coach, not the club registrar or Soccer Unlimited, to get that information. 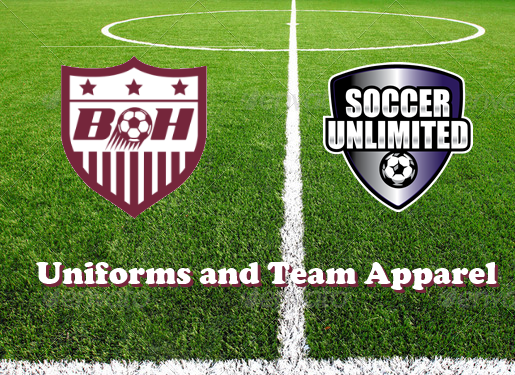 Sizes – If you didn’t have your child try on the uniform samples at tryouts, Soccer Unlimited in Clifton Park has a rack just for BHU with all the sample uniforms to try on before you order. Spirit wear – We now have a BHU spirit wear shop with items that will be available all year round. We will be adding new items on occasion so keep an eye out for that. Soccer Unlimited will also have some of these items in their Clifton Park store so you can take a look at them and size them before you order. Discount – Everything ordered during the uniform ordering period will be discounted to include the optional items and the spirit wear. Anything purchased outside the ordering period will be at the regular price. Please order the uniforms ASAP starting on August 8th to give Soccer Unlimited ample time to work through any problems if you encounter them.